The Pathfinder Roleplaying Game puts you in the role of a brave adventurer, fighting to survive in a world beset by magic and evil! 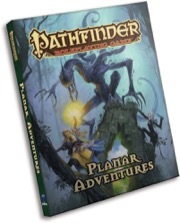 The Pathfinder Roleplaying Game line of products gives you the tools to bring enhance your own campaign—including hardcover rulebooks, monster and stat block volumes, and rules-focused supplements and accessories. Paizo releases an average of three new Pathfinder Roleplaying Game products annually. With your ongoing Pathfinder Roleplaying Game subscription, we'll send you each new installment and charge your payment method automatically as we ship each product. You only need to sign up once, and never need to worry about renewal notice or missed products. By starting a Pathfinder Roleplaying Game subscription, each release will be automatically bundled with any other Paizo subscription items you're subscribed to releasing in the same month. So, I wish I subscribed earlier - I waited because I wanted to support my FLGS and I wish that was possible with a subscription but I totally get why they can't offer this through the retain stores so, instead, I've found other ways of supporting my local shop by running games. Unsubscribing and Resubscribing to skip a product is as easy as an email - no hassle, no worry. If you're going to buy multiple subscriptions to get the APs and the companions and the so on, it's totally worth it and the discount and PDF covers shipping. If I was just considering one subscription, I'd probably buy it at my FLGS. Very pleased with the products and the product line. Subscription discounts + Free PDFs = The best way to buy Paizo products. Everytime I think that I have every rule book I really want for a complete game system, Paizo comes up with another one that I suddenly realize I need. They know their gamers well, and anticipate their desires. Books come with plenty of packaging to insure they are not damage in delivery, and the free PDF is very handy for those reliant on Ipads and the such at the table. Two thumbs up! Arrrg! Ye have me by the... wallet. What is the first product? 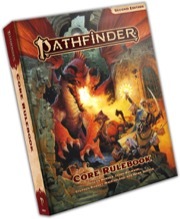 Pathfinder Roleplaying Game Core Rulebook (OGL) Hardcover. Not sure why it's not displaying here. Argh! Just sold my last remaining kidney..... Damn you Paizo...no more subscriptions please! This is perfect!! I have been waiting for something like this my entire life, but never realized it until you offered it! I've said it before and I'll say it again. PAIZO ROCKS!!! I too like the update, much nicer to work with. And, Oh my...September is going to be a big box. OK, how do I convert my PFRPG preorder into a subscription ? Yay! Subscribed. A question: Is there going to be any pattern which dictates how often these will come out? Such as every other month, quarterly etc.. Not a big deal, just curious. Thank you for your hard work Gary. You know you are a Paizo nerd when.... Oh look a new subscriber tag. Right now we're shooting for about three to four times a year, with one book each year being a monster book and one probably being something smaller like a GM Screen or softcover player's guide or something. We'll announce all of our stuff several months in advance to make sure everyone has fair warning. Any news on epic support? Does this mean that subscription/non-subscription combination shipping is available too? Hold everything and ship with the AP. Hold everything and ship once a month. Or Hold nothing and pay lots and lots of shipping fees. I'd like to exclude my PFRPG subscription from holding while still paying minimal shipping fees for everything else. Think something like this could be possible? Say a 'Hold' option for each individual subscription line? Darkwolf wants my head to asplode. When you subscribe, the system will automatically convert your existing pre-order to your new subscription order. This means we’ll have the free pdf, some time around August, right???? Is there a way to buy the RPG at Gen Con and get the pdf free? I'm happy to subscribe, but I also want the book for the con. Speaking of PDFS How much larger File size will this be? I live in a rural area with Dial up and takes about two hours to DL an issue of Pathfinder which I can handle. Now there are a lot of new subscriptions. Can someone explain to me the difference in titles people have? I now see "Paizo Charter Superscriber," "Pathfinder Chronicles Charter Superscriber," as well as a ton of individual subscriber tags. I just HAD to see the new tag! Yeah, I guess its going to take a while to convert pre-orders. Or you can go through the subscription order yourself and it will change things over. I'm in! Sweet, I have a much smaller tag. You must be getting EVERYTHING! Something to be said for someone who visited this site every couple of hours today just waiting for this to be available. Rewarded, I feel! I think the Chronicles subscription should go first, at least if a superscriber - otherwise it kinda doesn't make sense. Is there a comma missing in your tag list, Majuba? No... it says: "(Pathfinder Roleplaying Game, Pathfinder Chronicles Charter Superscriber, GameMastery Cards, Planet Stories Subscriber)"
I think it would be better to say: "(Pathfinder Chronicles Charter Superscriber, Pathfinder Roleplaying Game, GameMastery Cards, Planet Stories Subscriber)", listing the Superscriber first, then the rest that are "Subscriber"ships. 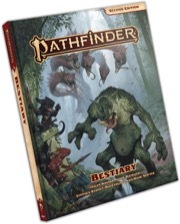 I see it as "Pathfinder Chronicles Charter SuperscriberPathfinder Roleplaying Game, GameMastery Cards, Planet Stories Subscriber" with the space missing between Superscriber and Pathfinder as indicated above.